Basketball fans gathered at Humber College in Etobicoke to watch the U14 OBLX season finale showdown on Sunday, April 7 and see what team placed as Ontario’s best. As an extra incentive for winners of the OBLX title, both the boys’ and girls’ winner of their respective Finals would move on to represent Ontario at the Jr. NBA World Championship Canada Regional for the chance to represent their country. 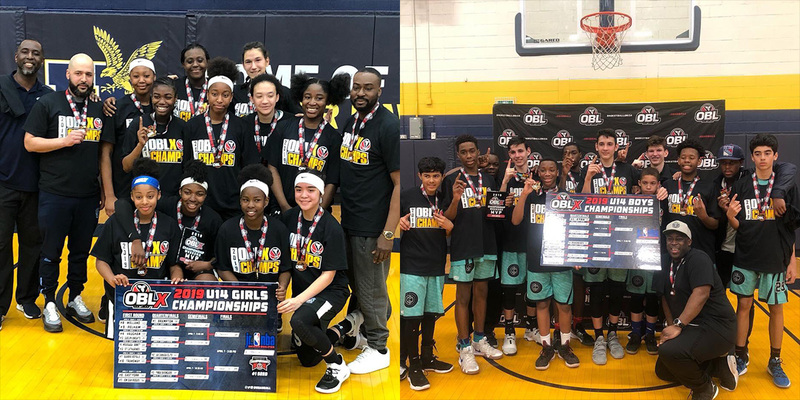 Congratulations to U14 Girls’ Ontario Jr. NBA reps, the Brampton Warriors who completed a 13-0 unbeaten season with their OBLX title and defeated second-seeded Canada Elite 64-37 in the Final. Milana Nenadic led a balanced Brampton attack with 12 points but the Warriors won with their defence forcing 19 steals in the game. Team members include Tene Smith, Summer Lee, Jordane Prendergast, Jada Bediako, Cyanne John, Anaya Johnson, Caidence Amartey, Hope Manglal-Lan, Milana Nenadic, Leia Brown and Janae Brissett, and coaches Keith Johnson, Emmanuel Amartey and Tene Smith. Congratulations to U14 Boys’ Ontario Jr. NBA reps, CIA Bounce who had a big weekend knocking off the #1 and #2 seed on their way to a closely contested 64-60 win over Brampton Breakdown in the Final. Jahnai Dunkley led Bounce with 30 points and 9 rebounds in the deciding game. Team members include David Intriago, Jovan Milicevic, Uros Milicevic, Ashton McQuaig, Tinaye Ngorima, Remi Tissington, Thomas Campbell, Zayne Vernon, Jahnai Dunkley and Jalique Dunkley, and coaches Nathan Teague Jr, Gamin Teague, Raysean Joseph and Stephen McQuaig. Written on 2019-04-08, in News.